What Day Of The Week Is September 11? 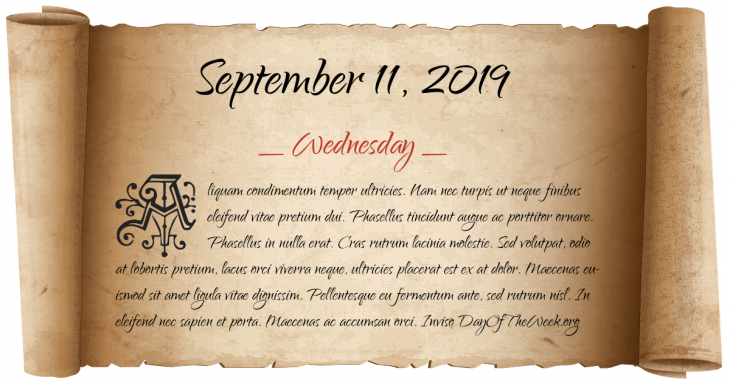 September 11, 2019 is the 254th day of the year 2019 in the Gregorian calendar. There are 111 days remaining until the end of the year. The day of the week is Wednesday. Siege of Barcelona: Barcelona, capital city of Catalonia, surrenders to Spanish and French Bourbon armies in the War of the Spanish Succession. Benedict Arnold’s expedition to Quebec leaves Cambridge, Massachusetts. Stephen Foster’s well-known song, Oh! Susanna, is first performed at a saloon in Pittsburgh, Pennsylvania. Salvatore Maranzano is murdered by Charles Luciano’s hitmen. Franciszek Żwirko and Stanisław Wigura, Polish Challenge 1932 winners, are killed when their RWD 6 airplane crashes during a storm. A coup in Chile headed by General Augusto Pinochet topples the democratically elected president Salvador Allende. Pinochet remains in power for almost 17 years. Who were born on September 11?